Depression is a difficult topic to explain to someone who has never experienced it. It can manifest in different ways for different people but it visits a lot of us. In fact, about 7 percent of the adult population in the United States suffers from depression. Debi Gliori has written and illustrated a beautiful picture book about depression and how it feels. Because you can talk and try to explain with words but still fail, this is a very effective method. The illustrations are lovely and evoke the actual feeling of depression. The young girl who is at the center of the story experiences a fog that rolls in...and she doesn't remember when. She experiences it at night and also during the day. The pictures and text continue to describe the feelings and illness that persists even while the character does not know how to describe them herself. The book doesn't end in a deep dark fog though the reasoning for the shift may seem hard to understand. Ultimately, I found this book to be effective and I think it would be a great conversation piece to discuss depression as well as a good gift to someone who suffers from it. 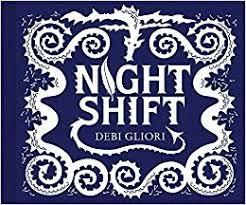 The gift of being able to express what it's like to experience such an internal condition is appreciated and I think Night Shift can add to our conversations and understanding.